The day is finally here! Ever since Monday when I realized I'd actually be able to finish the room in time (it was doubtful there for a while), and after many late nights, scraped knuckles, countless empty cans of spray paint, several do-overs, and hours of hard work, I finally get to share our new Master Bedroom with you! If you're a new reader checking in from the link party, I'm SO glad you're here. I hope you'll like what you see, gather some new ideas that you can use in your own home, and are inspired to make your home just a little more "you"! OK, so here we go! It was a long time coming, but every second of hard work for the past 6 weeks was totally worth it. I can't tell you how it pains me to see those photos. BOY, has my style changed! Actually, back then I don't think that was my style, I just did what colors and styles I thought I should do for a "grown-up" room. Lesson learned. basically a storage room for things to come, but everything was still a project needing to be done. I also sewed pillows and more pillows, customized the bedskirt and duvet cover, made the curtains, and recovered the cube ottomans. The craigslist nightstands got a makeover with a little surprise fix that I'll be sharing that soon. Even more than paint sometimes, hardware can make or break a piece! 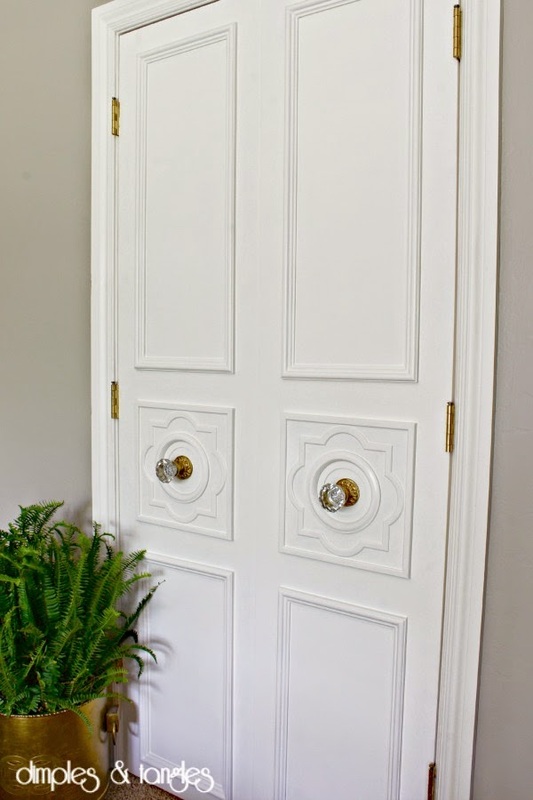 I've loved these scalloped ring pulls since the first time I saw them (thanks D. Lawless Hardware! ), and knew they would be perfect for updating the out of style pieces that these were before. I pulled things into this room from all over the house... the Dining Room lost a few of the Audubon bird prints, but I couldn't resist using them to flank the bed. The colors fit perfectly into my palette, and they provided interest without competing with everything else on that side of the room. The frames were recycled from my "way before" bedroom, and the warm tone ties together well with the darker armoire. Thankfully, my husband agreed to switching out the ceiling fan for a chandelier. I agreed to use a standing fan in the room, which we can tuck out of sight if needed. SO worth it to have a pretty light (plus, we can SEE at night a thousand times better than we could with the dinky fan light)! 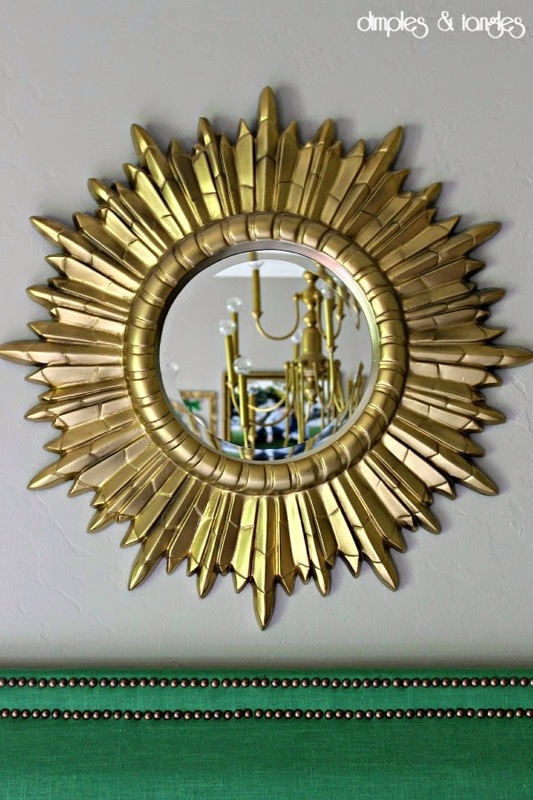 It was a Craiglist purchase that didn't start out so pretty, and you can read about it's transformation here. 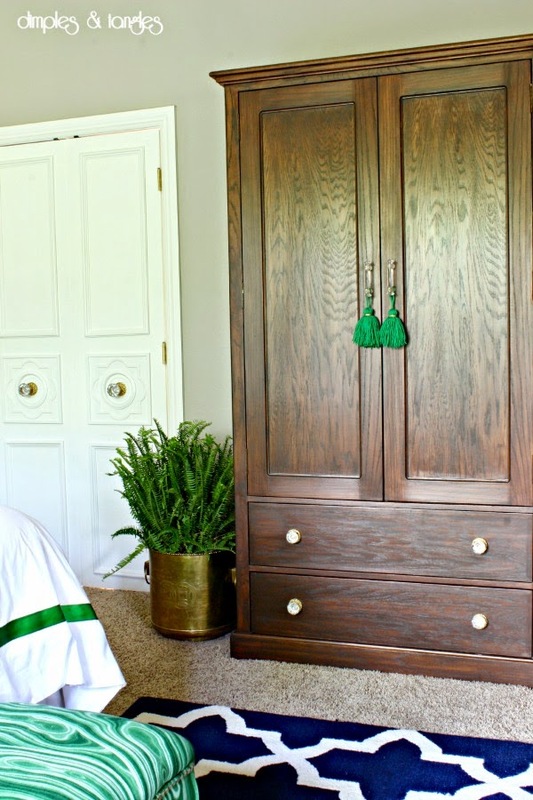 This week I shared about this armoire that my Dad made years ago, and how I updated it by darkening the stain. It provides great storage for the room. The doors leading to the bathroom (another makeover for another day!) were flat and I had painted them black a few years ago. With the dark armoire right next to them, I wanted to lighten them back up, and add some interest with moulding. 58 feet of trim and 64 mitered cuts later, here's where we ended up! I love them... they feel so fancy. See the tutorial for the doors here. Turning towards the opposite wall from the bed, we created a sitting area surrounding an electric fireplace (that's worth it's weight in gold in the winter!). 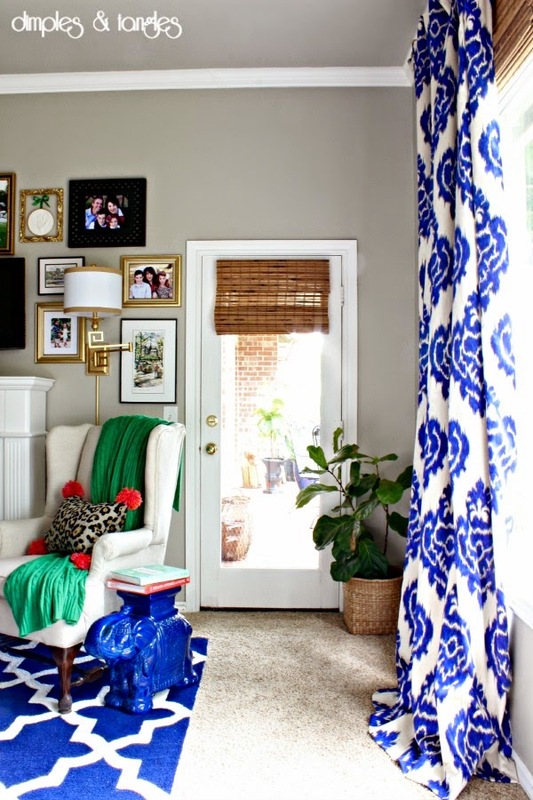 Even though our bedroom has wall to wall carpeting, I'm a huge believer in layering rugs. This bold trellis rug adds color,interest, and defines the sitting area. Rugs USA graciously provided this one for my room, but I've purchased two other rugs from them in the past, and have been beyond happy with each one. They run major sales often (mine is 75% off right now!) so there are great deals to be found, and a huge variety of options. From the moment I bought the brass tray table from Craigslist, I knew this is just the spot where I'd want to use it. The greek key swing arm lamps (thank you Lamps Plus!) definitely steal the show on this wall. They were the perfect choice here since they extend far enough to provide good light for reading in the chairs, and the wall mounts are nice since this space wasn't really cohesive for a floor or table lamp. We also love that the on/off knobs are actually dimmer switches, so we can select the brightness and the amount of light that we need. and some mementos from our travels abroad last year. 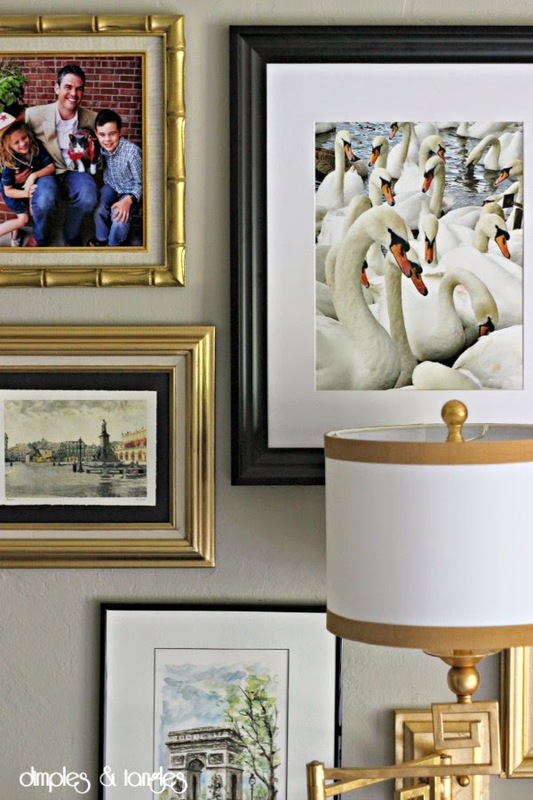 We photographed the swans on the Thames River outside of Windsor Castle, and included a print of the Rynek in the city center in Krakow, Poland and another of Windsor Castle itself on the other side of the tv. The fireplace gallery wall looks so pretty at night with the swing arms on... I've just been sitting on my bed and staring at it! And, as soon as a chill hits the air this Fall, we'll enjoy a cozier room with the flip of a switch. The cube ottomans are easy to use at the end of the bed, or pull up to use as a footrest at the wingback chairs. I've found a new favorite spot for blogging! I didn't want to conclude this post without giving a HUGE thank you to my family... they pitched in, lived amidst chaos for weeks and didn't mind one bit, fended for themselves for many a meal, and happily helped move, hang, assemble, lift, cook, and load the dishwasher. ;) I truly couldn't have done this without them! Beginning next week, I'll share more details and several more tutorials from projects that I did for the room. I'll also share some styling tips and photography tricks that I used, so stay tuned! If you have any questions I didn't cover, leave a comment and I'll address those next week too. Many thanks to Linda from Calling It Home for organizing this challenge. Just about everyone in the home blogging community rates ORC reveal days just about up there with Christmas Morning, so even though I'm so happy to share with you today, I can't wait to see what all of my friends have done in their wonderful spaces, too! Be sure to check out everyone else's reveals here, and if you missed any of yesterday's reveals from the Wednesday group, you can see that list here. So, so much good stuff, I know what I'll be reading all weekend! If you're a new friend visiting today, I'd love for you to stick around so we can get to know each other better! There are lots of options for us to stay in touch... sign up here to receive every new post in your email inbox, or click to follow me on your social media platform of choice. It's so perfectly you Jennifer and absolutely stunning! 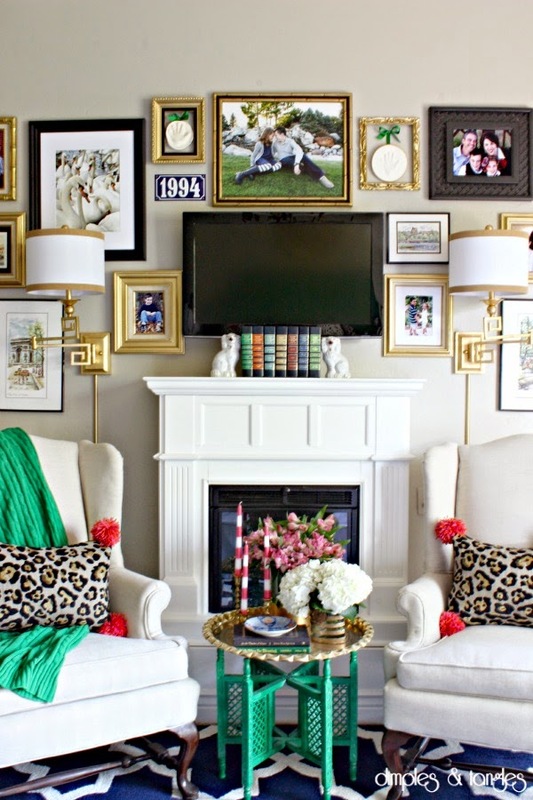 That chandy is definitely the statement piece and I just love the gallery wall! I'm sure you're so happy to have this space now! Jennifer, it looks amazing! And SO you. It's perfect. I love the photo of the swans- it turned out so well! 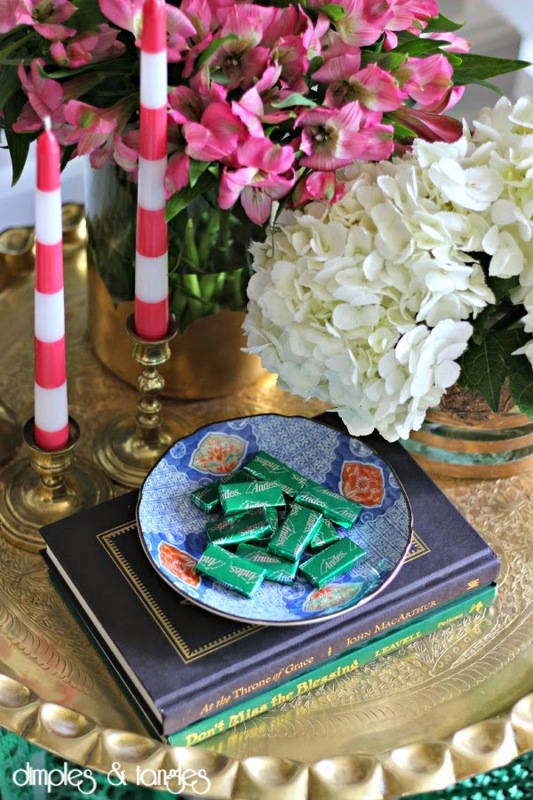 And the Andes mints...you really do think of every detail! Congrats, my friend! It looks fabulous! Jennifer, this is just beautiful down to every nail head! Seriously, you have some mad sewing skills and that woodwork is amazing! I loved seeing your progress each week with your bright colors! BRAVO on a job well done and a beautiful family that pitched in. BTW, love the mementos from you travel. Jennifer - it looks so great! So dramatic, fun, and just lovely. 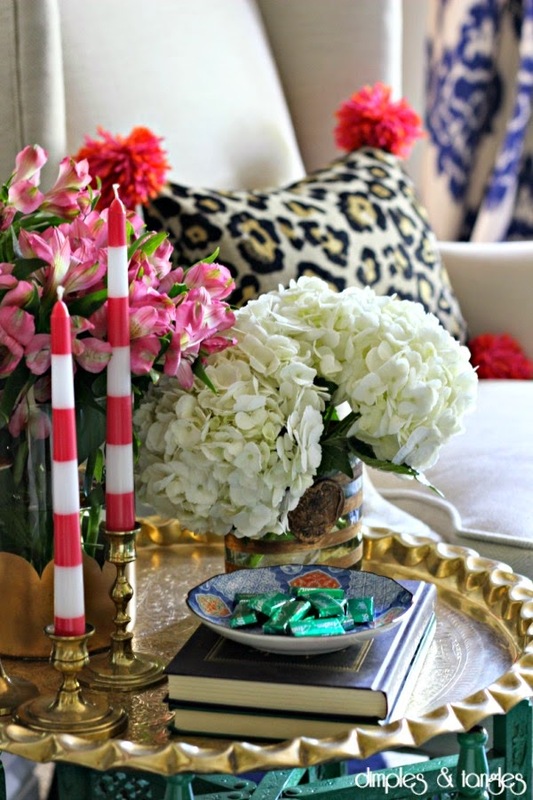 And those leopard pillows - perfection! Wow, this is sooo gorgeous! I just LOVE your style!!! The colors and all of the accessories are so amazing! I would never want to leave this room! Congratulations on an amazing transformation!! Thank you Brit! I still can't believe it's done after putting the project off for so many years! Thank you Andrea! I have been spending a crazy amount of time in there for the past few days. ;) So happy to have it finished! 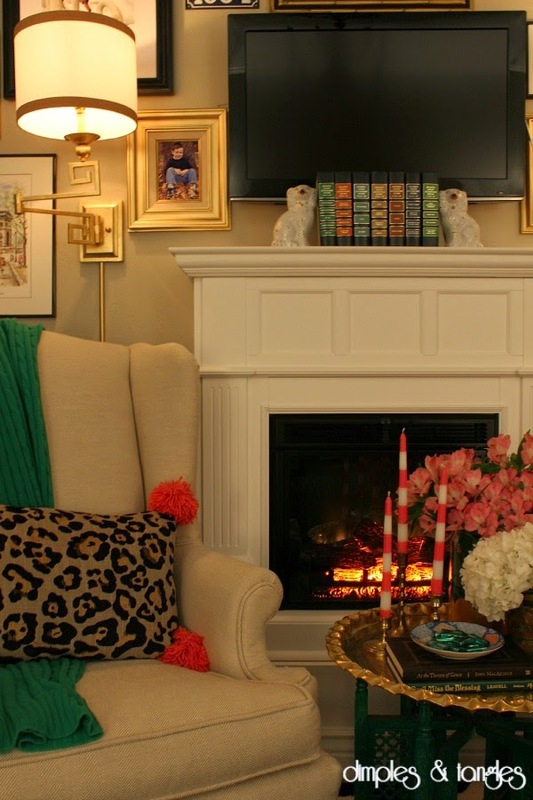 Your fireplace wall is perfection! Beautiful job! Love the bathroom doors and everything is beautiful! Great job! Simply beautiful! I love it all. Girl, you went all out!! Way to finish strong...GORGEOUS ROOM!! Love all of those fabrics. Jennifer, you knocked it out of the park with this one! What a beautiful space! No detail left out - I'm amazed at how much you accomplished in six weeks! Are you loving it now that it's all done? I know I am - I think it was you who told me that it was a crazy ride, but totally worth it in the end. For sure! Well done! Looks absolutely fantastic! Nicely done. Love love love all of the colours and patterns. 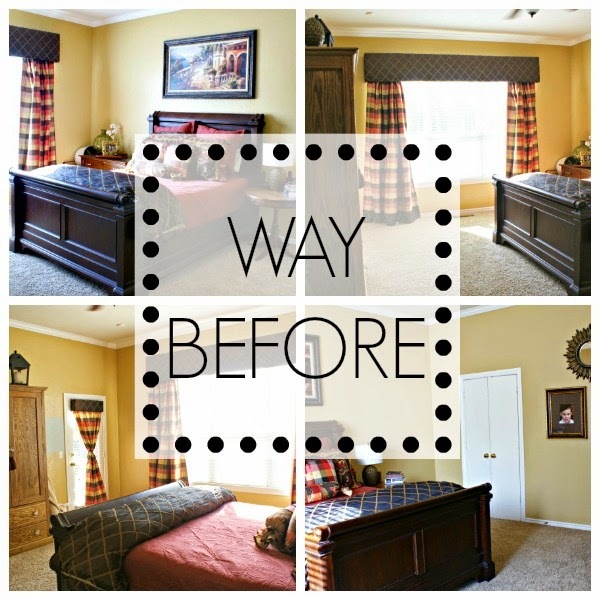 All your planning and hard work paid off, you finally got the master bedroom of your dreams! 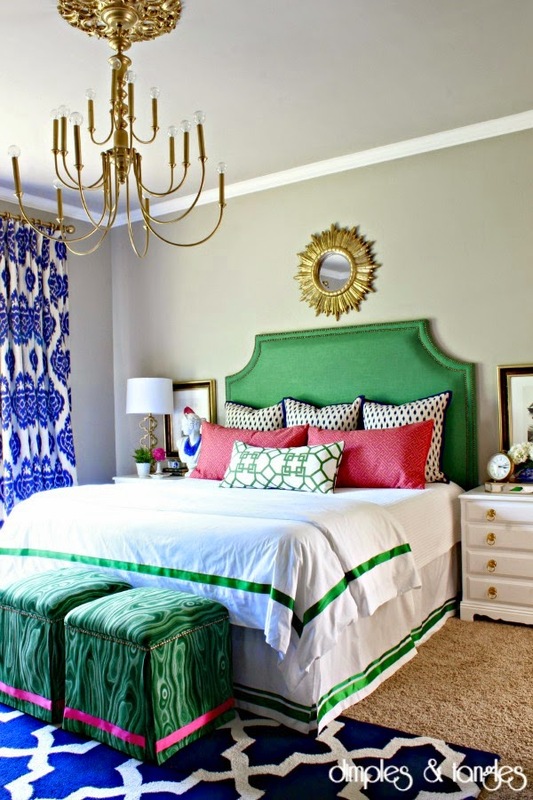 It's a feast for the eyes, from the malachite fabric covered stools to the gallery wall, and my favorite, your gorgeous headboard!! Enjoy your beautiful new space Jennifer!! What a gorgeous space! Way to go!! Wow, Jennifer! Your bedroom is gorgeous! 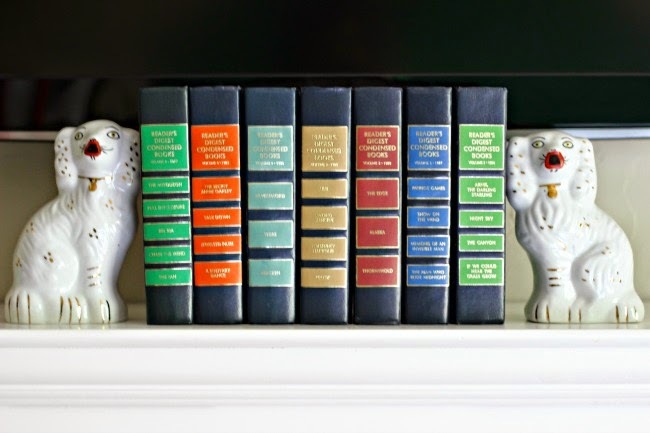 I LOVE all of your color choices throughout your house! 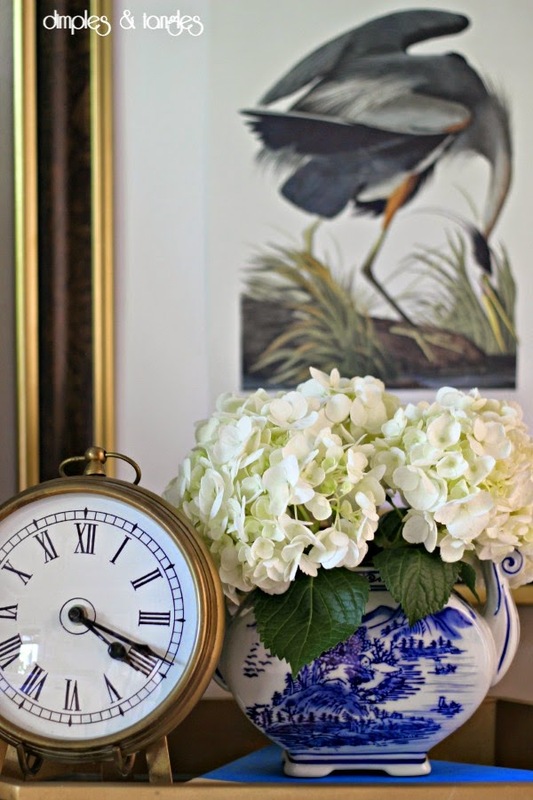 I have incorporated several things that you have shared on your blog in my own home and love the outcome! Your blog is something I look forward to reading every day! I love all the color! The whole room is just beautiful. So many wonderful details! Way to go! Jenn, I would have expected nothing less than this perfection from you but WOAH NELLY I'M OBSESSED!!!!!! 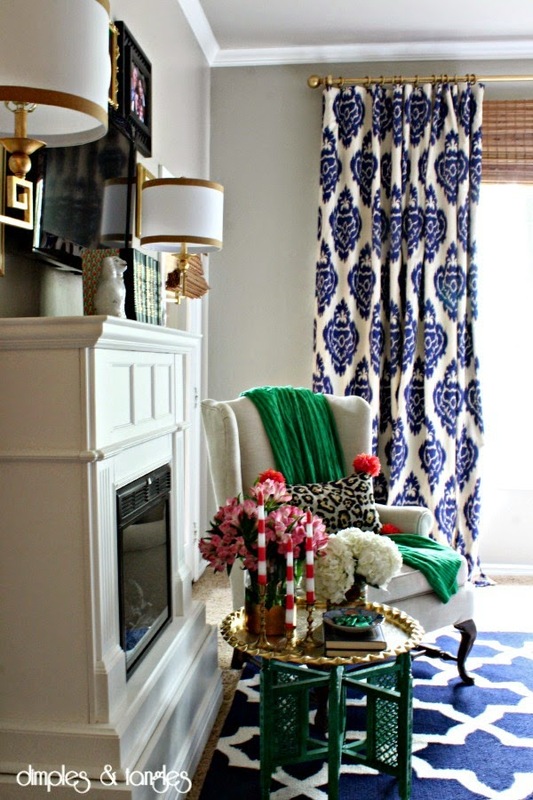 Your talent for mixing prints, patterns, and bold color makes my heart sing and is always so inspiring! and the collage of your sweet family helping is just about the best thing ever. Love it all, congrats mama! WOW Jennifer I knew it was going to be a stunner!! Love it all!! Totally fabulous Jennifer!!!!!! I love the fact that from the very first picture, it had your MARK on the room! Really so YOU dear, love all the colors and of course all the accessories you added!!! That chandy is just a real diamond in the rough! LOVE IT ALL! ENJOY! Bold colors and lots of fun its so great! Yay! You did it! It's gorgeous just like I knew it would be! 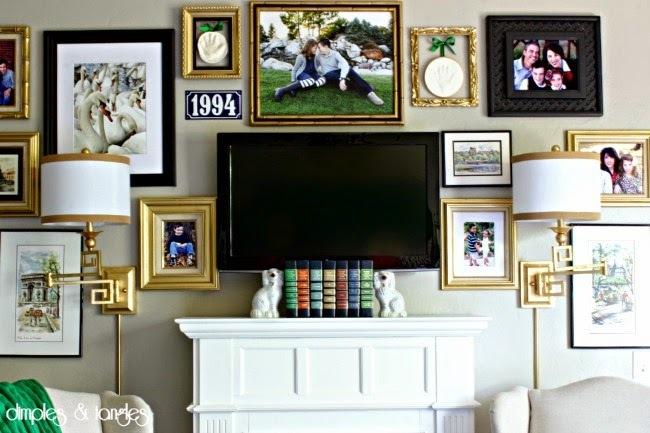 I love the gallery wall - it turned out great! And that headboard!! Enjoy some rest and relaxation in your new space - you've earned it! A completely enchanting space! I adore the colors you selected and can't wait to hear about the closet doors. I had to laugh about the million nail heads you tacked in. I took OUT at least a million tack heads to reupholster 100 year old chairs for my ORC challenge. Hope you'll stop by. Have a lovely Mother's Day! I was so excited to see your reveal and you did not disappoint! This is so you and executed to perfection! I hope you and your husband enjoy the space!! Great job Jennifer!!! What a great space! I love it! You're style is so fantastic - comfortable yet totally stylish and on trend. 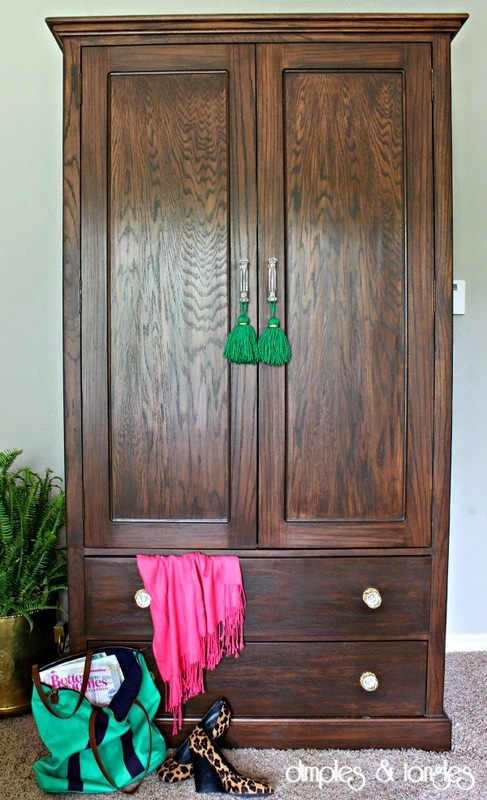 I adore what you did with your closet doors. Looks great and so "you"! Amazing how much you got done in such a short period of time. Such a beautiful new space! LOVE everything about this!!! 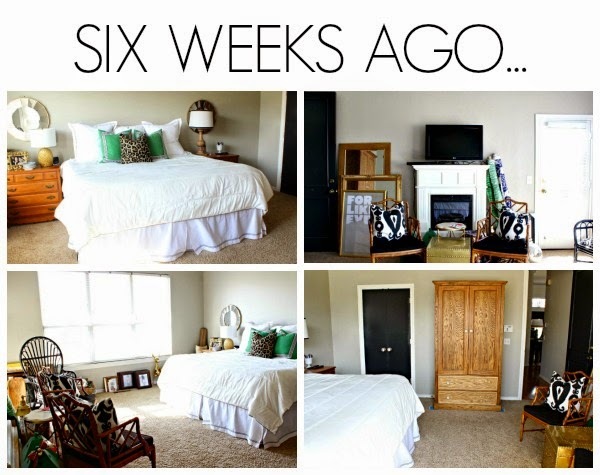 What a fantastic transformation... and yes, my room was a tribal effort, too!!! Parents and brothers and boyfriend schlepped and sweated and labored along with me. Can we all come hang out with you in your room?!? :-) Great job!!! Beautiful room!! Yes, it is bright and colorful but I think there are enough large neutral elements to keep it a serene space to rest and sleep in. 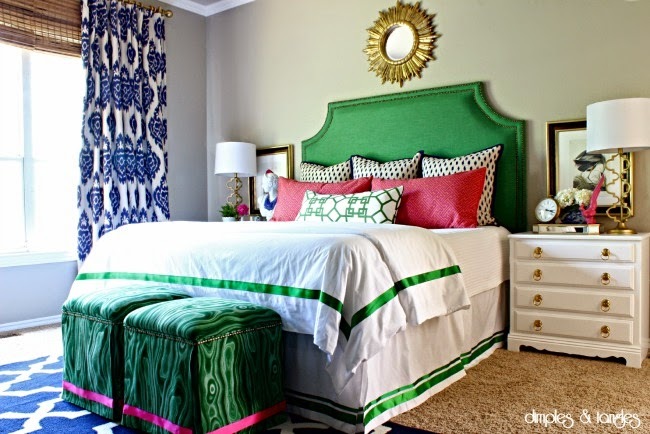 I absolutely love the green headboard and can't wait to see the tutorial!!! I work with fabric everyday, for my custom blanket business, and am excited to get my hands on some new fabric and create something for myself!! I bet that spot by the fireplace is going to be so perfect (probably moreso in the winter). It just looks so cozy and inviting. Great job on this room. I cannot believe everything you did in just 5 short weeks! Stunning!!! Your room turned out so beautifully, and you really did pull off a miracle with so many DIY projects. I love everything. jennifer, it is amazing! it is SO bold and so you.... LOVE those curtains so much, and the audubon art on the nightstands is a favorite, too! gorgeous gorgeous gorgeous! Jennifer, your room is gorgeous!! So many beautiful details, Your headboard came out so amazing and I love your artwork and that fireplace. So inspiring! Oh my gosh!!!!!! Jennifer, it's STUNNING! There's so much to look at and swoon over! That headboard couldn't be any more perfect and that chandelier ... sigh. LOVE it all my friend! An absolute show stopper! So, So, SO pretty! 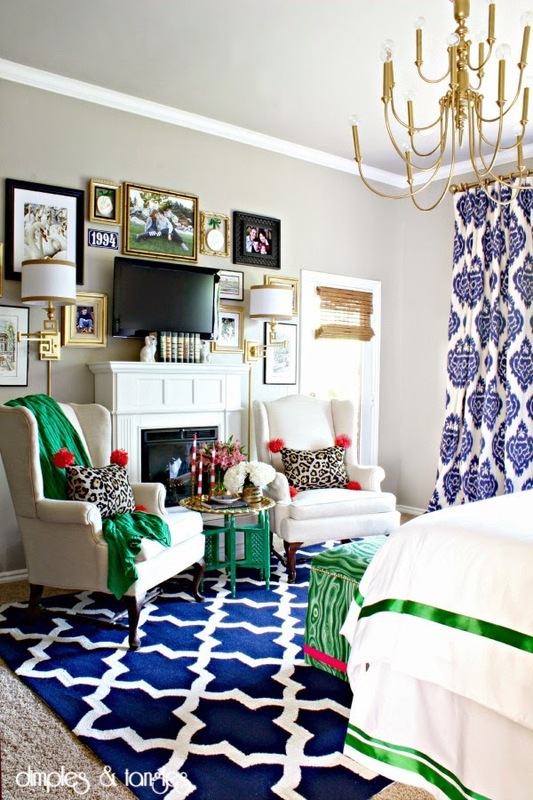 I can't get over those doors or the headboard! It was totally worth all of the hard work! Love the trim on the duvet too; just stunning! Congratulations on finishing such a gorgeous room! Huge kudos to all of your upholstery/sewing work - I know the work that goes into pulling all of that off, on top of everything else, all too well! wow, jennifer! this is amazing, and definitely my favorite room of yours! congratulations for getting it done! I am completely blown away that you hammered all those nailheads! I am impressed!! Beyond that the space is so happy and colorful, I am a color lover as well! Beautifully done! I LOVE all the color! It looks so fabulous! You did an amazing job. What a great room to hang out in. Jennifer this is insanely good! Did you have all of these amazing accessories just sitting around your house?! (You probably did!) You didn't miss a single detail...all those late nights were totally worth it! You better keep an ear out for the magazine editors that will be calling today! Jennifer - You did such a fantastic job!!!! 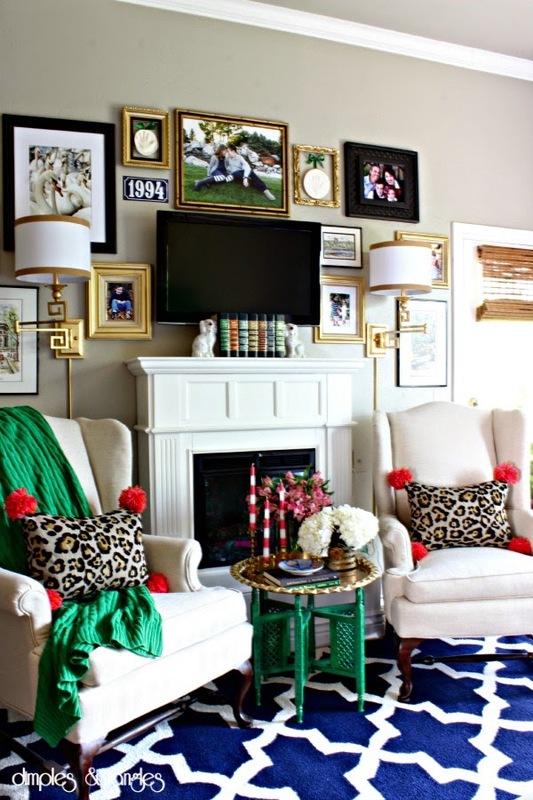 I love all of the colors and accessories and love, love, love your fireplace and family gallery wall. Congratulations!! Oh my!!! It's more beautiful than I even imagined! Vibrant and sassy, and perfectly captures your style! You've worked SO hard on everything, the headboard is killer! I'm thrilled for you that you have a stunning space to enjoy! Hands down the best ORC i've seen out of the group!!! I absolutely love your pattern mixes and colors!!! #DREAM ROOM! Great job, Jennifer! Loving all the color :) Beautiful! I'm green with envy over how beautifully it turned out. I love all the pops of emerald green. Such a great retreat! I love the outcome, the green & blue looks so fresh together. Good job! The pops of color are perfection...well done!! Great combination of colours and patterns. Beautiful bedroom! I cannot even describe how much I love this room! It's amazing, Jennifer! You've outdone yourself! Seriously, this room is beyond beautiful. So many well thought details that make is even more special!!! Stunning Jennifer! No detail left undone. Love all your bold pops of color as well. You hit it out of the ballpark. 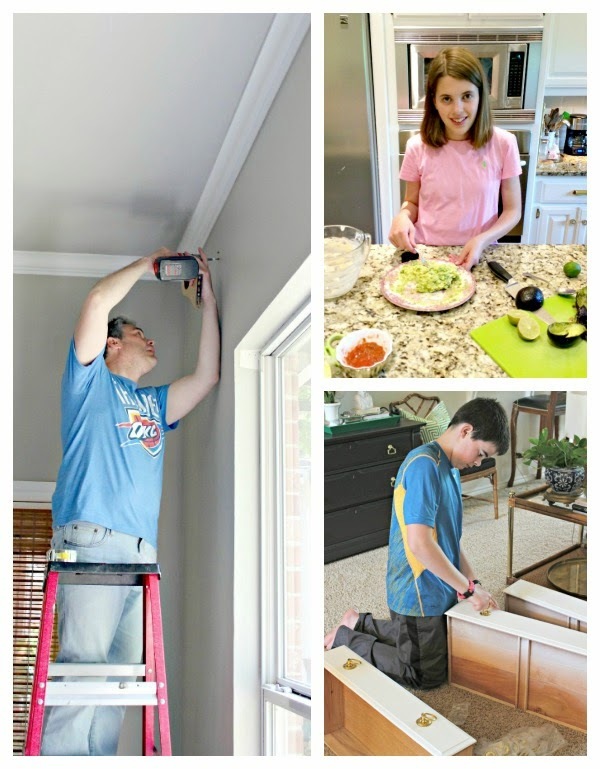 I love that you DIY'd so much of the room and that it was a family affair! That seems to make it so much more special. Bravo! You definitely took it up a few notches, and this communicates your vision perfectly! Wow! Just gorgeous. Love the colors!! And that fireplace reading area!! It's official, you didn't sleep a wink over the last 6 weeks! I'm so impressed with your many talents, Jennifer. Your headboard and those doors...greatness! Unbelievably beautiful! 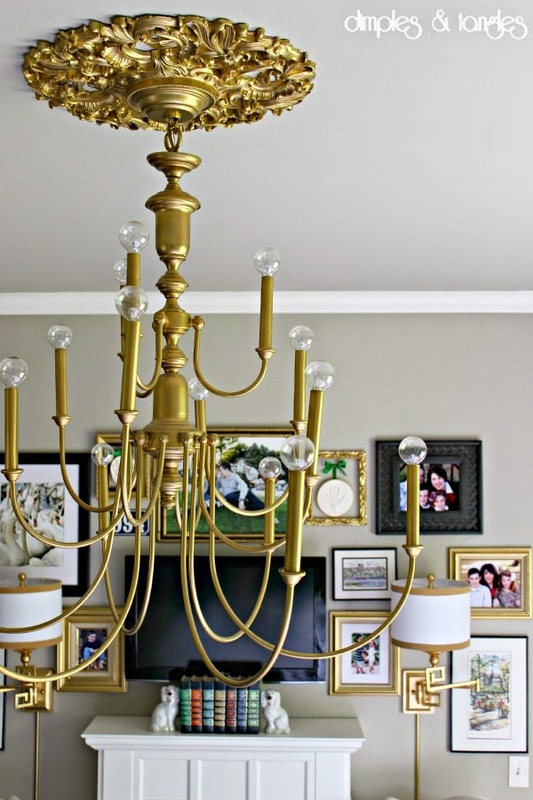 Love the headboard, drapes, gallery walk, gold... All of it is amazing Jennifer!! LOOKS WONDERFUL! I love color and these are fantastic! So fantastically gorgeous and so very, very "you." In all the best ways. Beautiful job!! I can't remember if I commented before...lol, but this room is just gorgeous. It is so beautiful!! I love the colors and every single detail. 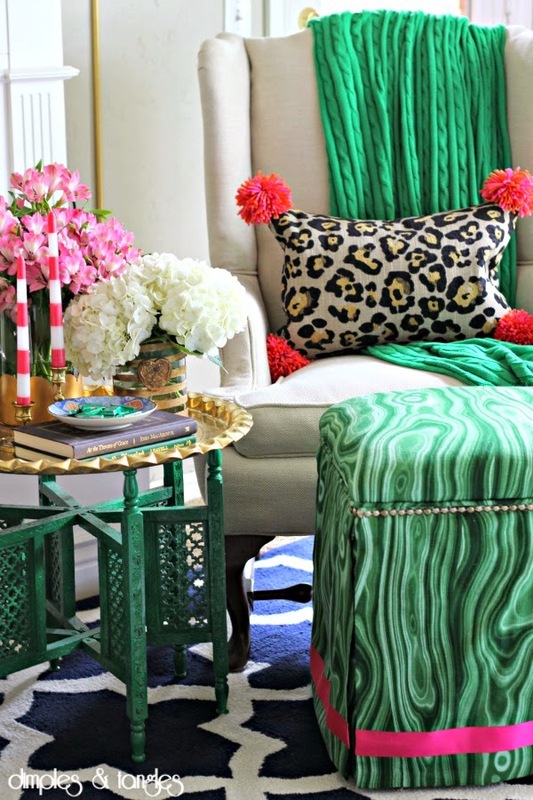 Love the leopard pillows with the pompoms, the malachite ottomans, and just love the bed and those fabulous drapes. What an amazing transformation. I love how your entire family helped out! Jennifer- this is stunning! I love your attention to detail. This space is so you and I love that you have created a room that reflects you and your family so much. It is absolutely gorgeous. Well done, my friend! And you are spot on about the one room challenge- it is like Christmas morning!! Absolutely fantastic, Jennifer! You left no stone unturned, and there is so much to love about this room. 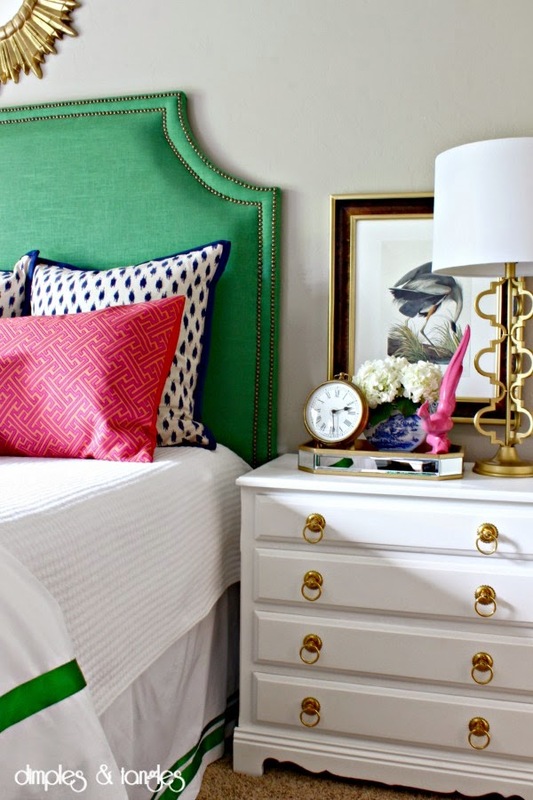 Swooning over that headboard, among other things! Your room is pure eye candy Jennifer! You also make it accessible to everyone since most of it is DIY'd. You inpsire me to add more color to my very neutral bedroom!! Stunning! I don't want to be boring but it's amazing what you accomplished in the 6 weeks. Kudos to your family for their help! Have you just crawled up in your bed, relished the end result and slept? :) So many unique DIY's ~ just suffice it to say, pure beauty! Wow, what a great transformation! I love the layered look and how cozy it now looks! Absolutely amazing. 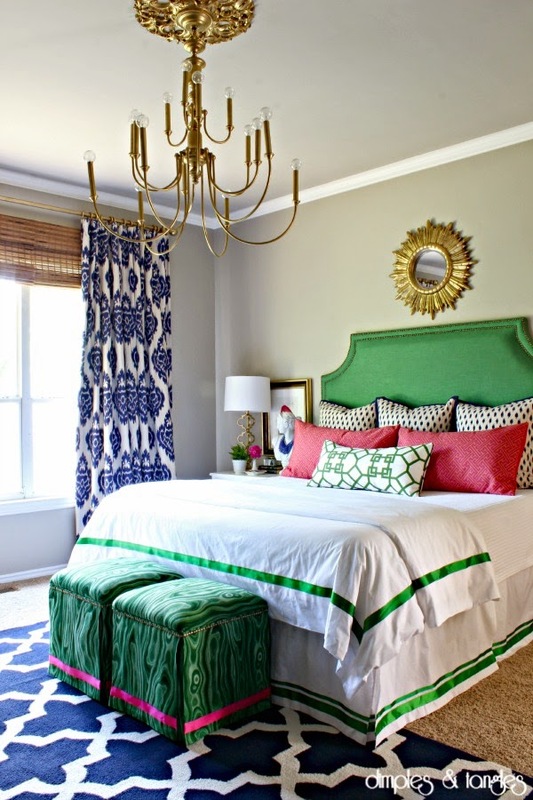 I too love bold colors in my house and you have hit a home run with your bedroom. You should be extremely proud of yourself. And did I say absolutely amazing!!!!! I've always liked navy and emerald green together, but you've made it feel so fresh and I love the pops of pink. 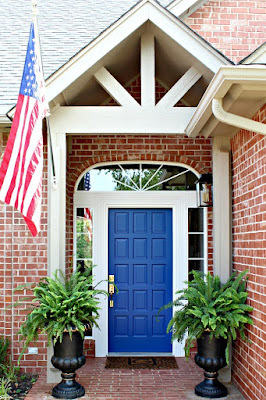 I am amazed by your trim molding on the doors - so great! The fabric for your headboard! It's amazing. Would you please, please share the source? Thank you!! Jennifer, Jennifer, Jennifer....where do I begin. I love this. It is an amazing transformation and an incredible tribute to your lovely family for pitching in. Unbelievable job. Well done. You are amazing Jennifer. I love you and I am so happy to do life with you! Thanks Cori! It's listed in the Source list at the end of the post. Jennifer! I just love what you do! So happy, elegant, fun, gorgeous. I can just imagine what joy this beautiful room brings you! Jennifer....wow! Isn't it great when you finally decide to makeover a room....after it is done you are all like "what took me so long to do this!" It looks fabulous so now you can sit back and relax in your beautiful bedroom! It is stunning Jennifer! I can't pick a favorite part, there are so many great elements! I can't believe you accomplished all this in just a few short weeks, I'm sure you are enjoying it! 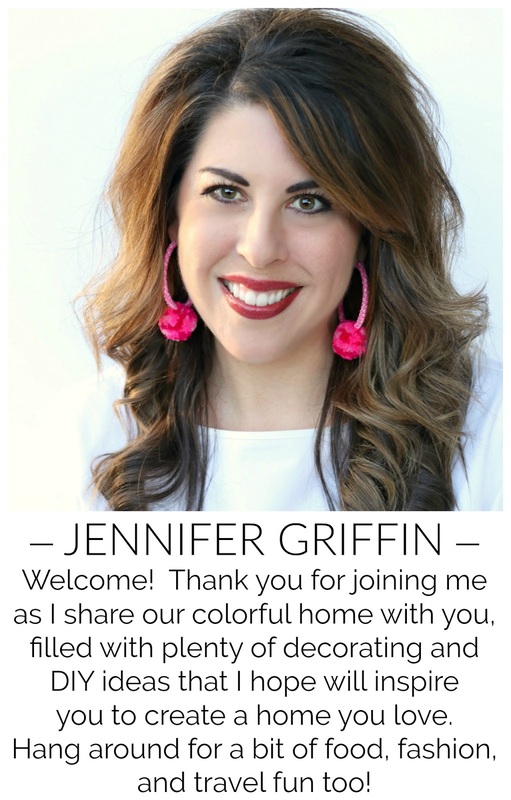 WOWSA Jennifer, the headboard, the sconces, every detail in the room! SO So good you nailed it (as always) bravo lady! I absolutely love this colour palette! Seriously! 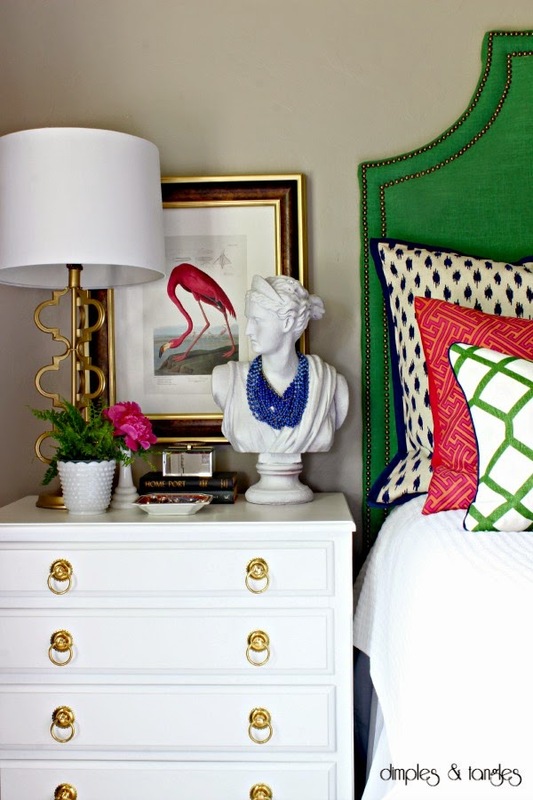 The comb of Navy Blue with Emerald Green is perfect and the pops of pink are just enough. Perfect room! 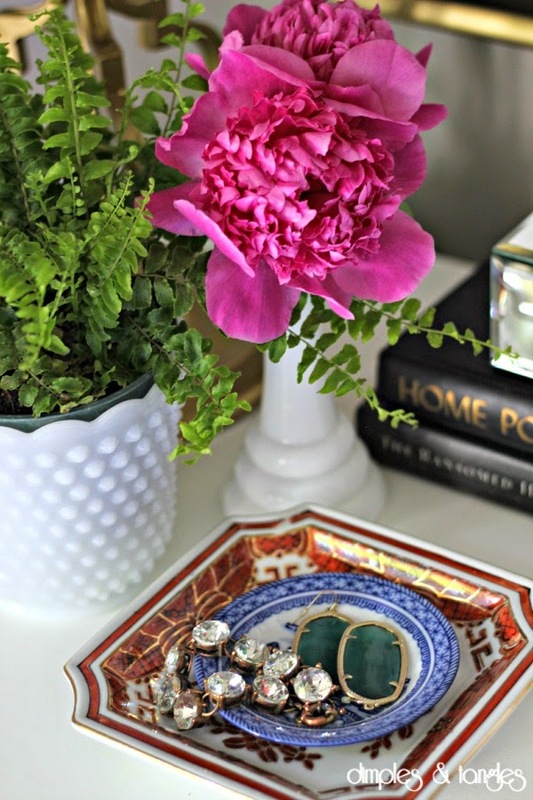 I share your love of color and emerald green, so this room makeover delights me! I love it! Fabulous job!!! One thing I love about you is your consistent style! It's beautiful! What a striking bedroom! It's perfect for us to share in our new bedrooms post, bedroom decor with green. I'll send you over the link shortly. Making my own headboard this weekend what fabric did you use to cover yours? I am in love with this bedroom. Hi Meredith, thank you! I'm actually planning to finally get a tutorial for my headboard posted this week! This was my fabric: http://www.fabricguru.com/p-fabric-by-the-yard/allen-linen-slub-drapery-malachite It's a great weight and has help up very well. Happy headboard making! Jennifer, I have been going through your blog for hours, I just love everything you do! Your love of color makes my heart happy. I have gotten tired of seeing ALL white homes! Thanks for sharing all you do. I will be a loyal follower! 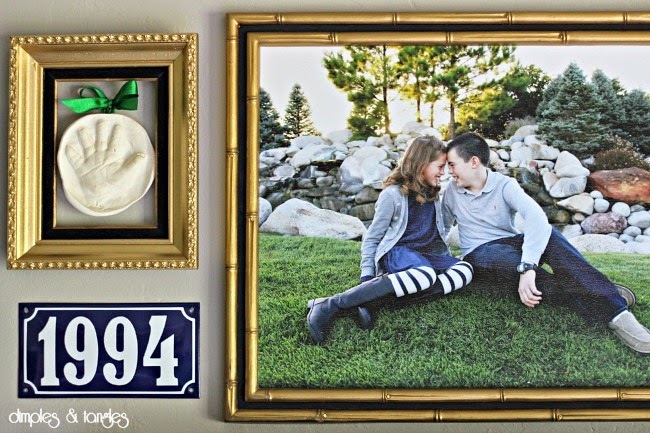 I love the wall with photos and prints from your trips as well as family photos. That's what makes your style so attractive- you add your personal touch. I'm from Poland, so I especially love your print from Krakow- one of my all time favorite cities to visit. Hey Jennifer! I've been looking for a bed skirt JUST like this everywhere!?!? Did you make this??? I know this is an older post but I'd really appreciate any advice on where I could find one!!! I love your style! You can reach me at: aelizabetht14(at)gmail just in case you aren't still replying here :) Thanks!! Hi Ashley! Yes, I sort of made it. ;) It was a simple white bedskirt with an embroidered stripe along the edge. I used fabric glue to attach grosgrain ribbon over the embroidered edge (one wide stripe and another thinner stripe). That's it... easy!